'Maine Tujhko Dekha', the new song from Rohit Shetty's upcoming comedy ensemble film Golmaal Again, is a spin on the popular song 'Neend Churayi Meri' from Indra Kumar's 1997 romantic comedy Ishq. 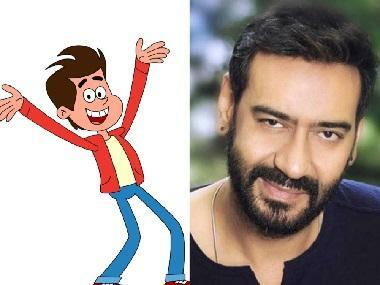 What the original and the new song have in common, besides the chorus and signature tune, is Ajay Devgn. While the actor shook a leg with his wife Kajol, Aamir Khan and Juhi Chawla in the original track, he is seen chasing Parineeti Chopra in the new song, with his gang of Arshad Warsi, Kunal Kemmu, Tusshar Kapoor and Shreyas Talpade in tow. Also, since the original song was composed by Anu Malik, the makers roped in his nephew Amaal Malik to rehash the music for the new song. In an interview to Rajeev Masand, Amaal had mentioned how he does not like rehashing old numbers and ensures that his contribution to the new song is 80 per cent and that he only borrows the hook line from the original track. As can be observed in 'Maine Tujhko Dekha', Amaal sticks to his word. The new song is sung by Neeraj Pandey and Sukriti Kakkar; and penned by Kumaar and Rahat Indori. Golmaal Again also stars Tabu, Johnny Lever, Prakash Raj, Neil Nitin Mukesh and Sanjay Mishra. It is co-produced by Rohit Shetty Productions and Sangeeta Ahir's Mangl Murti Films. It is slated to release this Diwali on 20 October.